Ladies of the Court—Irmela Appreciation Day! It’s Martha’s Vineyard time again. Hallelujah! It’s Matakesett Tennis time again. Halleluyah! The Ladies of the Court have reconvened. We are bigger and better than ever. New faces, new friends, and new fodder for fierce competition or friendly play. What’s not new is the great job performed by the “Queen of Matakesett Tennis,” Iremla Fitzgerald. She and George, the tennis pro, take such good care making sure everyone has people to play, everyday. But what really makes this group so great is that we talk to each other—before matches, between games, and when switching sides as we wipe off the sweat and quench our thirst. Catching up on careers (varied as are our hometowns and ages), kids/grandkids, and the challenges of life is almost as therapeutic as whacking that tennis ball back at your opponent (and winning that critical point). Therapy is free as we help solve each other’s problems. 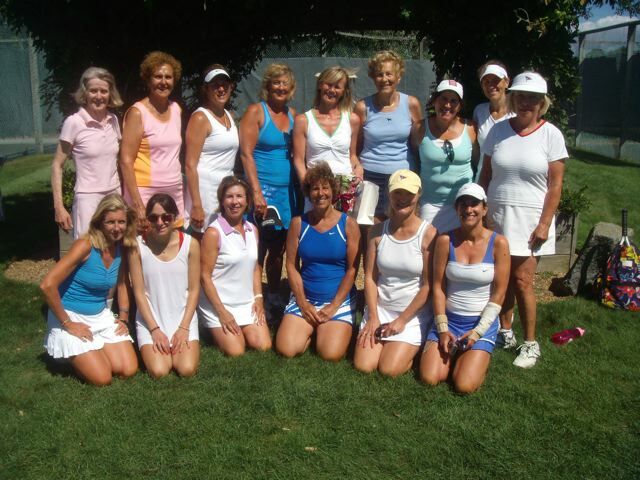 One regular, a long-time Vineyarder, mentioned she was having trouble telling her winter league tennis partner she wanted to move on to another partner, to another level of play. Devoting more time to her game than her friend from early childhood had made the match uneven. Non-confrontational, she was agonizing over the time when she would inevitably have to share with her friend her plans to find a new partner. After teasing out her feelings and the facts, we all helped her to formulate (and then practice) the words which she could feel most comfortable with while making this transition but not damaging the friendship. (I really think men do not agonize over these things the way we do!) Mission was accomplished; bruises are minimal, at least at last report. So last Friday, 16 of us played a two hour round robin. Much fun! This year I (thankfully) placed somewhere in the middle of the group (I am improving after all those lessons, finally.) But the real fun began after the tournament was over. Under the pergola (which acted like a wind tunnel, but served the purpose of keeping the hot almost noon sun from beating down on our already sweated brows), a brunch feast was set out, each one of us having made a small contribution. Cheeses from France by Francine and her daughter Katherine. Fresh red and green peppers adorned the caponata provided by our nutrition and health expert, Nancy Javaras. It was as beautiful as it was delicious. Delicious quiche from Morning Glory Farms from Susan, and, of course, let’s not forget the champagne provided by Nan Tull (and others? Forgive me if I didn’t get that credit exactly right—leave a comment, please). Flowers, wine and a beautiful necklace were the group’s gifts to Irmela. As usual, she acted surprised (as she has for at least the past 5 years), and overwhelmingly pleased. Her usual bright smile was bigger and brighter than ever. As we posed for the annual picture, I could not help think about how much more than tennis is played out on these courts. Deb started mentoring Amanda, both interested in fashion design and marketing. Dana and I talked to Susan’s daughter Haley about becoming a doctor. Felice keeps us limber (and yes, sometimes sore) with her early morning yoga classes. And Nancy keeps us up to date with the newest (pharmaceutical grade) supplements she so graciously provides as gifts for the winners. We have expanded and have quite a reputation now. at Mattakesett tennis. We have all shared so much more than tennis over the years. We are a great community who all help each other with life’s trials and tribulations. (including parenting) Thanks for sharing this wonderful blog. You are awesome! 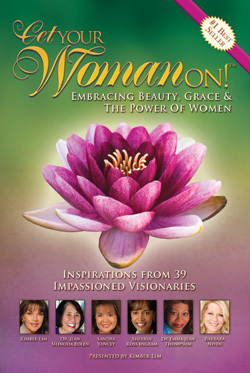 Linda- you capture and promulgate the spirit that makes this a wonderful and supportive group. Thank you for this posting! 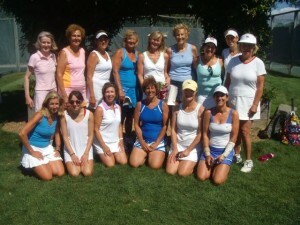 I am so lucky to have found so many women who are fun, interesting, and really play great tennis. Thank you for letting me in and keeping me on my toes on and off the courts! You are all fabulous. Thanks for reading, too. Hope you keep checking in…..